Chester FC produced an impressive showing in a hard-fought draw away at Stockport County this afternoon. The Blues took the lead through Akwasi Asante but were pegged back by a Sam Walker penalty on the stroke of half time. Only home ‘keeper Ben Hinchliffe’s man of the match performance prevented the travelling Blues from heading home with three points. The Blues made two changes from the impressive victory over Darlington last weekend. Adam Dawson came in for the suspended Dan Mooney, whilst Gary Roberts was straight back into the side following his suspension, replacing Cain Noble. Chester settled into the game well, amidst heavy rain at Edgeley Park, but it was the hosts who forged the contests first chance, Matty Warburton running from just inside the Chester half before dragging an effort wide of the Blues’ goal. County had a gameplan, that looked to exploit the Blues on the counter-attack, but with Chester winning the ball high up the pitch, they managed to get Akwasi Asante space into the penalty area, and the striker, full of confidence from his debut hat-trick, unleashed a fierce effort that struck the base of the post before the hosts could clear it away. The lively opening continued as Stockport managed to create another opening on the edge of the Chester penalty area as Frank Mulhern cut inside but his effort was low and Shenton did well to hold it in the wet conditions. There was a big blow for the Blues midway throuhg the first half as Danny Livesey was forced off with an injury and striker Deane Smalley replaced him at centre half. Stockport immediately sought to take advantage of that change as Thomas’ shot was deflected and cleared by the Chester defence. In the twenty-fifth minute the Blues got a big left off though, Deane Smalley’s foot got stuck in the turf and it allowed Frank Mulhern to burst forward, he played it to Matty Warburton, who coolly slid it past Grant Shenton, only for the post to save the Blues! The frantic pace that the game was being played at continued, and next it was Chester’s chance to go close. Adam Dawson’s corner was headed back across goal by Steve Howson and Simon Grand’s header could only hit the outside of the post. Chester forced another chance on the half hour mark, as Akwasi Asante’s wonderful touch and turn created a yard of space, but Hinchliffe was on hand to deny him and Simon Grand’s follow-up effort was deflected behind for a corner. It was from that corner that the Blues scored the opening goal of the game, Dawson’s set piece went over Hinchliffe and Asante had the goal that his wonderful skill moments earlier deserved, tapping home from inside the six yard box. Stockport looked for an immediate response and when Minihan broke into the penalty area it looked like there was a chance, but Gary Roberts quickly got back to put it out for a corner. From the resultant set-piece Adam Thomas could only head over the crossbar. With a minute to go before half time Stockport got the perfect opportunity to equalise, Duxbury’s free kick appeared to hit the hand of Deane Smalley and Stockport were awarded a penalty. Up stepped Sam Walker, who sent Grant Shenton the wrong way and evened the scores going into the break. The second half was much quieter in terms of chances, with Stockport pressing higher up the pitch and looking to have a little more energy than the Blues. It was the visitors who went closest though as Howson’s ball forward found Asante, he played it to Dudley, who struck a lovely curling effort that Hinchliffe made a superb save with his fingertips. Moments later and Hinchliffe had to be alert again, Simon Grand’s perfect cross found Asante, but his header was too close to Hinchliffe, and the County ‘keeper was again on hand to make the save. The chances kept breaking to the visitors and when Craig Mahon’s cross was met by Anthony Dudley it looked like the striker may have fired his team ahead, only to be denied by Ben Hinchliffe, who got just enough on it to slow the shot down then fall on it on the goal line. The hosts kept pushing though and had a couple of chances in quick succession, first Nyal Bell created space inside the penalty area only to fire low and straight at Shenton then left-back Scott Duxbury met a cross into the Blues’ area and his bullet header was over the crossbar. Stockport continued to press inside the final ten minutes and spurned a golden opportunity when the ball fell to Matty Warburton inside the penalty area, the Stockport forward struck confidently, but his effort was blocked by the Blues defence. 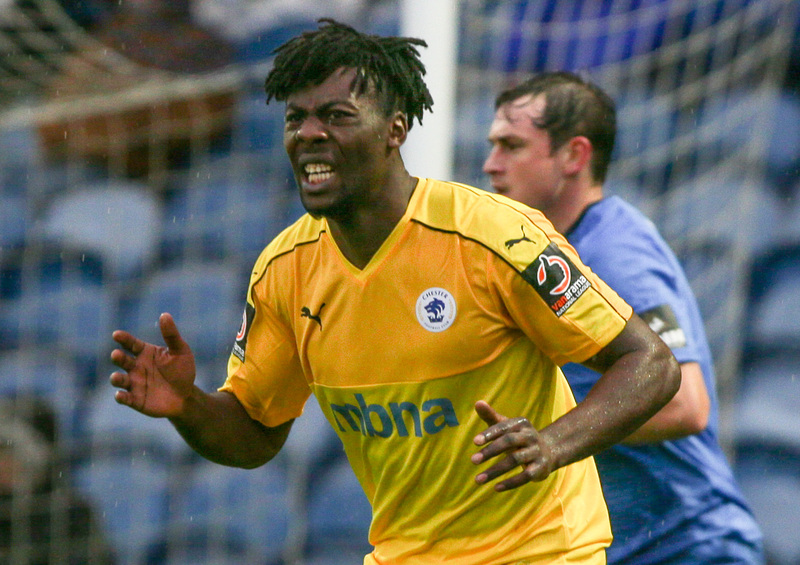 Chester almost snatched victory with five minutes to go as Steve Howson’s outrageous chipped through ball found Asante, he controlled it but was caught as he went to shoot, no penalty was awarded and the Blues striker was substituted off shortly after. Chester: Shenton, Thomson, Grand, Roberts (c), Livesey (Smalley 23), Howson, Mahon, Stopforth, Asante (Noble 87), Dawson, Dudley. Stockport: Hinchliffe, Minihan, Duxbury, Keane, Palmer (c), Stott, Thomas, Walker, Mulhern, Osborne (Stephenson 45), Warburton. Subs: Cowan, Ormson, Turnbull, Bell. Goal Scorers: Stockport: Walker (45+1). Chester: Asante (33). 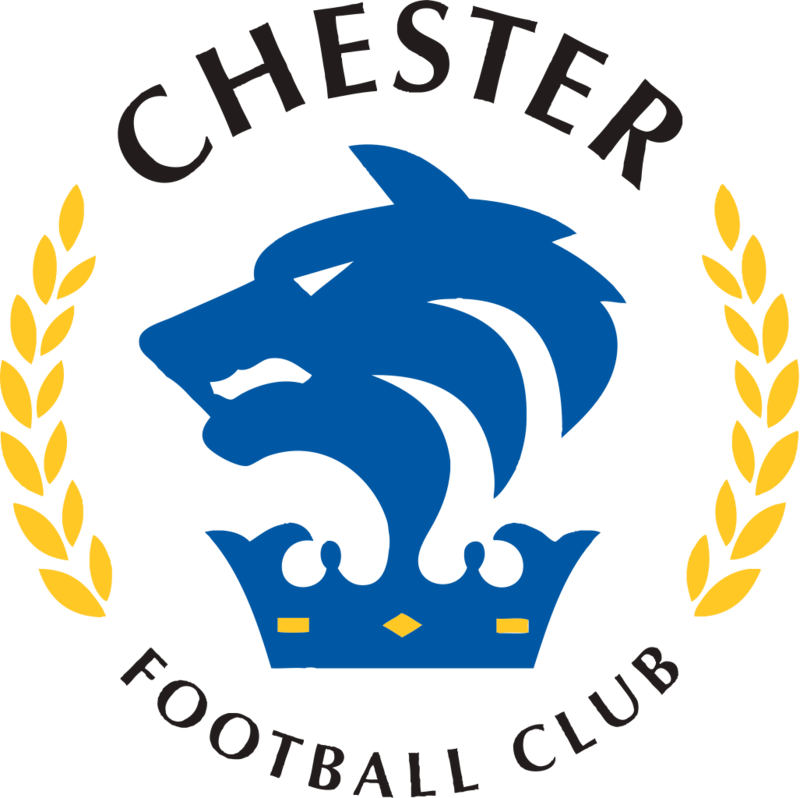 Yellow Cards: Chester: Dawson, Stopforth, Howson. Assistants: Steven Lawson, Samuel Ross.